Traditional business models owe a great deal to the military. The hierarchy of responsibilities, from CEO to shop-floor, resembles those of a traditional military organization. So what, then, can the world of business learn from the armed forces? To find out, I spoke to Yap Kwong Weng, a Young Global Leader, social activist and entrepreneur who joined the Navy SEALs at 23. After surviving Hell Week – one of only 25% of intakes to complete this five-day challenge that aims to push participants to their limits – Yap was in a near-fatal car accident. He still went on to complete his training. As Yap explains, if there’s one thing that’s needed both in the military and corporate world, it’s this: empathy. Those people who think of empathy as a fluffy concept might be surprised to hear how important it is in the military world. How so? Teamwork is the number one priority in Navy SEAL training. It’s therefore essential to show empathy towards one another so as to have a strong support group. 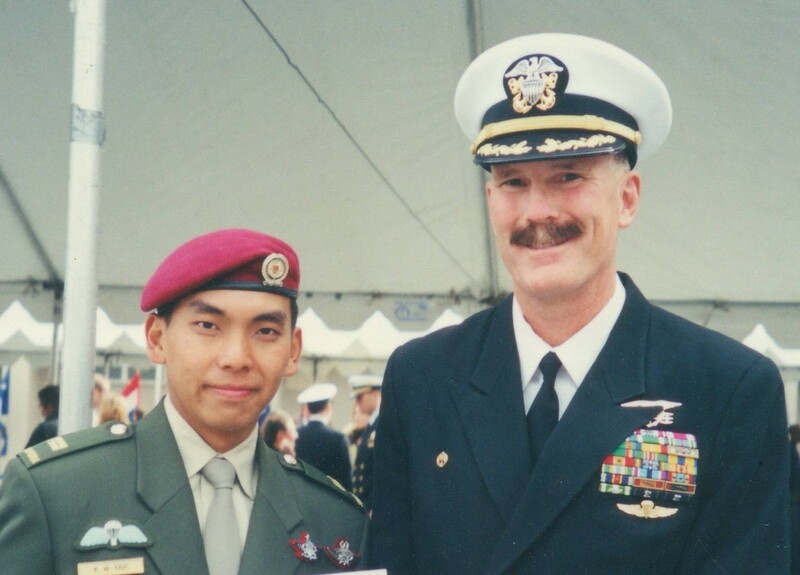 I endured some hard times in the Navy, but because I always had a buddy to turn to, I had a sense of connection with someone else, which kept me going. When the water was too cold, my buddy would encourage me to go in. When things would get tough, he would say “this will pass, just continue”. When he was feeling down or defeated, I encouraged him in the same way. Mutual support is fundamental in these challenging circumstances. It’s exactly the same in the corporate world. The challenges you encounter might be different, but that same connection, that shared empathy, is what will get you through. And what about showing empathy towards yourself, as well as others – has that helped overcome challenges? Empathy has helped me accept “failure”; I no longer let it consume me like I used to. Before I started training with the SEALs, I was a very proud person. For example, I was always concerned about how others perceived me, and I felt insecure that I hadn’t gone to an Ivy League school. Over time, I let go of this self-judgement, and was honest with myself. Sometimes you must acknowledge that to be a human being is also to make mistakes, and that if you don’t fail, you will never taste real success. Aside from your fellow officers, did any of your leaders in the Navy exercise empathy? Halfway through my training, a car accident left me with a fractured collarbone and two broken ribs, and I needed two insertions in my lungs because they were punctured. It was nearly impossible to keep up with the training in those circumstances. To do so, I relied on the support of my classmates and instructors. But there was one person who went even further: my commanding officer, Captain Smithers, who was a war veteran. He has fought so many wars and tours of duty that he understands the importance of friendship and goodwill, and truly believes in the idea that Navy SEALs never leave anyone behind. His empathy towards me and my situation helped me get through. How has the empathy you learnt in the Navy SEALs changed the way you manage your current organization? Navy SEAL training changed my perspective. Learning to accept my failures and acknowledging my purpose in the world made me practical and realistic. This has enabled me to give more time to understanding other people. We couldn’t get through a mission without teamwork. Now, when I do business I’ve learnt that my best successes come when cooperating with others. The military taught me to take the initiative, so I no longer wait for permission to take action. Today, I lead my business, jumping into risk and taking on challenges, but never comprising on empathy as one of my core values. And how has your work since leaving the Navy helped you develop this sense of empathy? I’ve realized that I am a very small thing in life. Simply, I come and I go. What I intend to do is to leave something meaningful behind. Not necessarily a legacy, but something that other people will be able to reap the benefits of. Believing there is a strong purpose enables me to think more about others, and have a greater understanding of what people need and feel. This kind of empathy is something which is lacking in the world today. Having endured some extreme situations, what advice would you give to someone who wants to express empathy but is under pressure or facing adversity? Face reality with a calm mind, keep close to your team, and remember change is near. A balanced and rational headspace is key. You have to distract your mind and leave your current situation, because otherwise you will always be stuck there. Fundamental to military cooperation is teamwork. Recognizing you have a support network, and respecting one another’s feelings, keeps spirits high in the harshest of conditions. This helps you overcome the temporary pain and remember that you’re not alone. Be aware that even in tough times, people are subject to change – your circumstances can change and we are all evolving for the better. In the harshest times you must always try to focus on positives like the future and remember there is love in this world. Yap Kwong Weng is the CEO of Leap and has recently published a book exploring his life’s journey. Belinda Parmar is the CEO of The Empathy Business. Is teamwork slowing you down?